From left, front row: Mrs. Gabriela David, Mr. Pierre Nora, Prof. Brenda Milner, Prof. Marvin Minsky; back row: Prof. Peter St. George-Hyslop, Prof. Saul Firedlander, Mr. Krzysztof Czyzewski, Prof. John A. Hardy, Prof. Itamar Rabinovich, TAU President Joseph Klafter, Mr. Ariel David, and Prof. Katherine E. Fleming. 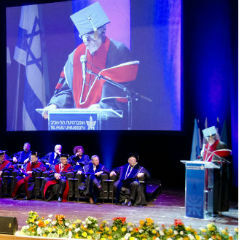 The prestigious 2014 Dan David Prize was awarded to seven scientists and intellectuals before an audience of prominent political, business, philanthropic, and academic figures during Tel Aviv University's 2014 Board of Governors annual meeting. The prize, one of the most lucrative in the academic world, is endowed by the Dan David Foundation and has been administered by Tel Aviv University every year since its inception in 2002. The Dan David International Board each year chooses different fields of study for Past, Present, and Future categories, and a review committee of scholars and professionals select laureates who have made outstanding contributions. All Dan David Laureates donate 10% of their $1 million award to a fund for outstanding doctoral and post-doctoral candidates. This year, for the first time, all three prize categories shared a common theme: the mind. The Past category was dedicated to "History and Memory"; the Present to "Combatting Memory Loss"; and the Future to "Artificial Intelligence, the Digital Mind." In his opening remarks at the ceremony, TAU President Joseph Klafter said, "We are paying tribute tonight to some of the world's greatest academic leaders whose insights have generated entirely new ways of understanding how the mind works and how it influences past, present, and future realities." Prof. Friedlander authored the definitive work Nazi-Germany and the Jews 1933-1945, initiating a sustained debate over the proper periodization of Nazi history, the extent to which the Holocaust and the history of the Third Reich should be considered exceptional, and the ways in which victims' experiences ought to be integrated within the overall narrative of the Holocaust. Prof. Friedlander shared the Past category prize with two co-recipients: Krysztof Czyzewski, a renowned Polish publisher, writer and theater director, public intellectual, and social activist was recognized for the integration of the history of "borderless peoples" into Poland's past, present, and future. The third recipient of the prize was Pierre Nora, a French public intellectual and publisher, who established the historiographic interpretive category "Les lieux de mémoire" ("Sites of Memory"), about the intricate connections and oppositions between history, public use of the past, and centrality of memory in a media-saturated world. At the ceremony, Prof. Friedlander spoke on behalf of the three recipients: "The past is a foreign country, a boundless domain. ... Notwithstanding our differences, all three of us wish to get closer to the heart of that country," he said. Pictured: Prof. Marvin Minsky, world-renowned cognitive scientist. Three scientists shared the $1 million award: Prof. John A. Hardy of University College London, a molecular geneticist, was the first to discover the mutation in the gene coding for the amyloid protein, which plays a primary role in Alzheimer's neurodegeneration. Prof. Peter St. George-Hyslop of Cambridge University and the University of Toronto, and also a molecular geneticist, identified the "pathway," or initial event, leading to the death of nerve cells causing brain damage in Alzheimer's patients. Prof. Brenda Milner of McGill University, Canada, spent a lifetime identifying the existence of different types of learning and memory, all of which depend on distinct areas of the brain; her pioneering research has paved the way for modern learning and memory research. Hailed by the Dan David Foundation as "one of the most influential intellectuals of the twentieth century," Prof. Marvin Minsky, scientist and philosopher, was among the founders of multiple related disciplines: artificial intelligence, robotics, computation, learning, cognition, philosophy, and optics. Accepting his award, Prof. Minsky thanked the Dan David Foundation and spoke about his confidence in the resourcefulness of human beings. "We'll find ways of putting our minds in machines and then make back-up copies and live forever. After all, there is no reason we should stand for dying," he said. "There are bad futures and good science fiction-type futures, and I vote for the latter."